Quick pumpkin custard topped with a crunchy granola topping. SO good! Great for holiday meals! Can make ahead of time and warm up when ready to serve. Top with powdered sugar, whipped cream or ice cream. Took this to a party and it was gone in a flash! 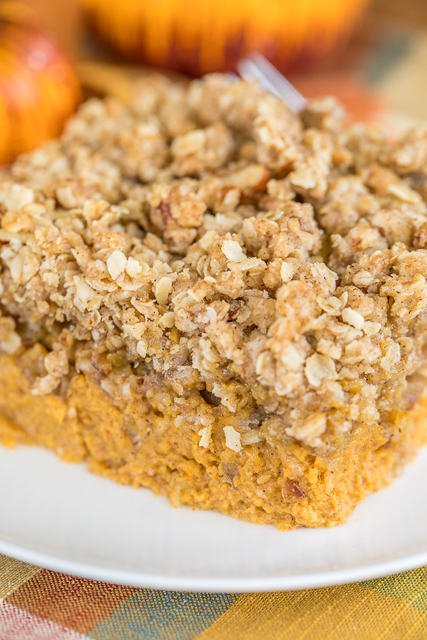 Such a great pumpkin dessert recipe! It is the time of year when everything is pumpkin and pumpkin spice. I don't go crazy over pumpkin, but I like a good pumpkin dessert every now and then. 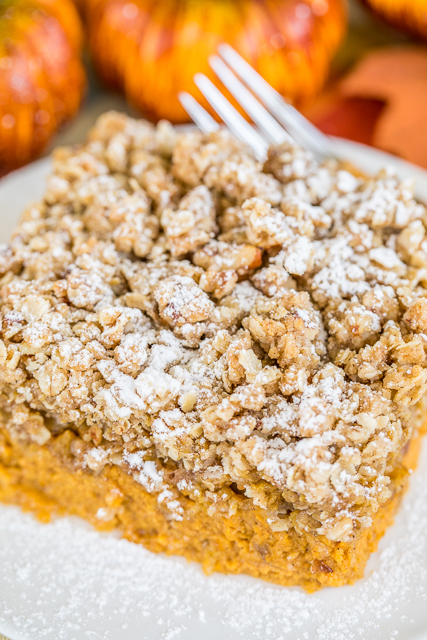 This Pumpkin Custard Crunch is a new favorite. It is super easy to make and it tastes great! I especially LOVED the crunchy topping!!! The base of this Pumpkin Custard Crunch has a large can of pumpkin and a can of sweetened condensed milk. SO, you know it is good!!! The topping is a mixture of oatmeal, flour, brown sugar, cinnamon, pecans and butter. 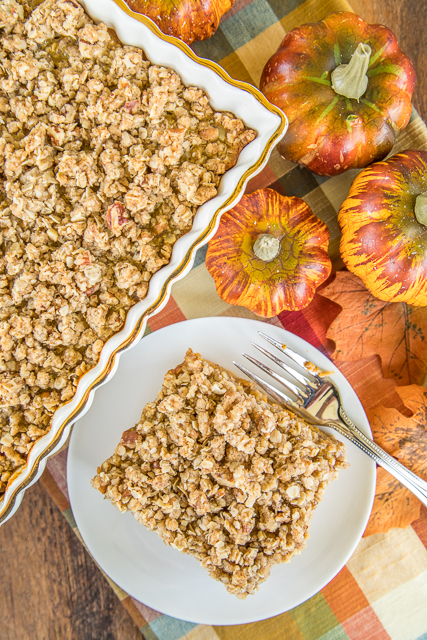 A cross between a streusel and a granola. It is to-die-for. I'm already thinking of what else I can put it on. I'm thinking about baking a batch and putting in in my ice cream. YUM! 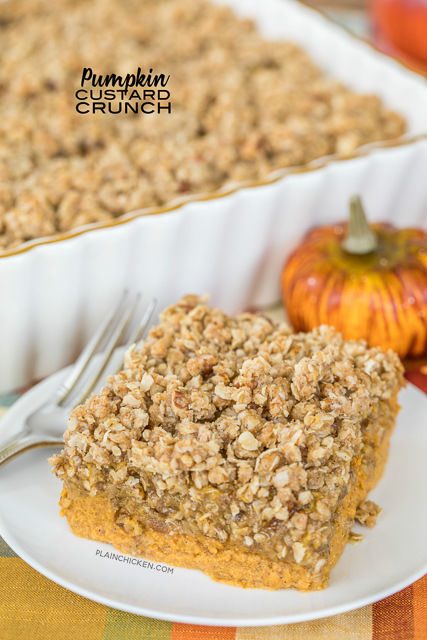 You can make this Pumpkin Custard Crunch ahead of time and warm it up when you are ready to serve. We sprinkled a little powdered sugar on top. You could also add a big dollop of whipped cream or a scoop of vanilla ice cream. This will definitely be on our Thanksgiving table next month! YUM! Mix together pumpkin, eggs, pumpkin spice, 1 tsp cinnamon, sweetened condensed milk, milk and vanilla. Pour into prepared pan. Stir together oats, brown sugar, flour, 1 tsp cinnamon and pecans. Stir in melted butter, mixing well. Sprinkle oat mixture on top of pumpkin mixture in pan. Bake for 50 to 60 minutes, until toothpick comes out clean. Is the 29-ounce can 100% pumpkin or pumpkin pie filling? Yum! I'll have to give this a try - Thank you. 1 full pound of cheddar for your 4 cups? or lightly fill them? Thank you.